Thank you so much for praying for us!! We’ve seen the Lord do so much in our support this past month and we’re currently working to raise $750/monthly support — we’re so close! We’re praying to have our support complete by the end of the month. Thank you for praying with us, encouraging us and walking alongside us through this chapter of our ministry. This month, we thought it would be fun to share how the Lord has been teaching us through our times in His Word. I (Courtney) am currently doing a bible study on the book of Daniel — I’m learning so much. If you’ve seen me/talked to me at all in the past month I’ve probably told you about it. I’m learning a ton about myself and the Lord and I wanted to share it with all of you. The gospel is in everything. The gospel is the deep stuff. The gospel is constantly “bearing fruit and growing” (Col. 1:6). If the gospel is in a constant state of growth, then everything has to do with it — God, humanity, salvation, worship, work, relationships, shopping, personality … everything. However, most of us have reduced the gospel to something much less than it is. We’re currently in a series with our students talking about “The Gospel-Centered Life.” We’re using this awesome tool developed by World Harvest Mission. Specifically, Bob Thune and Will Walker — two pastors who partnered together to help their church grow in the gospel. We’re teaching on the lessons they wrote in our weekly meetings, our bible studies, and our discipleships. The lessons I’m reading, teaching, and applying are not new to me. This is just one of the clearest tools I’ve ever used to communicate the gospel-centered life. Simple, deep, and transformative. The gospel is nothing less than the “power of God” (Rom. 1:16). However, “the gospel” is a phrase that Christians often use without fully understanding its significance. We speak the language, but we rarely apply the gospel to every aspect of our lives. How will you live out the gospel in your life so it is in a constant state of “bearing fruit and growing”? Many Christians live with a truncated view of the gospel. We see the gospel as the “door,” the way in, the entrance point into God’s kingdom. But the gospel is so much more! It is not just the door, but the path we are to walk every day of the Christian life. It is not just the means of our salvation, but the means of our transformation. It is not simply deliverance from sin’s penalty, but release from sin’s power. The gospel is what makes us right with God (justification) and it is also what frees us to delight in God (sanctification). The gospel changes everything! The following model (see image above) has been helpful to many people in thinking about the gospel and its implications. 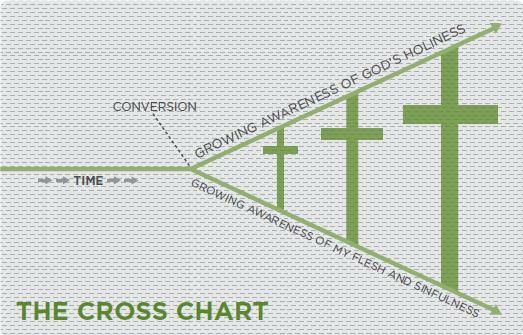 This diagram does not say everything that could be said about the gospel, but it does serve as a helpful visual illustration of how the gospel works. The starting point of the Christian life (conversion) comes when I first become aware of the gap between God’s holiness and my sinfulness. When I am converted, I trust and hope in Jesus, who has done what I could never do: He has bridged the gap between my sinfulness and God’s holiness. He has taken God’s holy wrath toward my sin upon himself. At the point of conversion, however, I have a very limited view of God’s holiness and of my sin. The more I grow in my Christian life, the more I grow in my awareness of God’s holiness and of my flesh and sinfulness. As I read the Bible, experience the Holy Spirit’s conviction, and live in community with other people, the extent of God’s greatness and the extent of my sin become increasingly clear and vivid. It is not that God is becoming more holy or that I am becoming more sinful. But my awareness of both is growing. I am increasingly seeing God as He actually is (Isa. 55:8-9) and myself as I actually am (Jer. 17:9-10). As my understanding of my sin and of God’s holiness grows, something else also grows: my appreciation and love for Jesus. His mediation, His sacrifice, His righteousness, and His gracious work on my behalf become increasingly sweet and powerful to me. The cross looms larger and more central in my life as I rejoice in the Savior who died upon it. This is from a devotional that compiles Scripture and puts them in first person as if God’s voice is speaking directly to you. We need to stop fighting the truth. God is with us. He knows us. Seek His face. Making an eternal mark on earth should be our most important goal in life. God is the headliner in our story. If we view God as insignificant, we’ll think His plans for us are too. Does God have a title role in the story of your life? This morning I found myself in the book of Isaiah. Isaiah 62:12 to be precise. I took a moment to glance through my ESV Study Bible to find that the “they” is “God’s old covenant people Israel, plus all others willing to join them.” So in short, us. Me, you, the Christian of today and the Christian of yesterday. Believers. For those of you that have been in a labyrinth (or like me, have been in one in a video game), you know that at some point, it gets very nerve-racking, almost scary because you’re not quite sure where you are. But any labyrinth that any of us have experienced, there was no real danger in our experience. But in the labyrinth that Spurgeon is describing, there is evil and harm around every bend. And God waltzes in and seeks us out. He marches into our dangerous situation and rescues us. Redeems us. Brings us home. Every day I try to read this daily devotional written by CH Spurgeon. There’s a morning and an evening passage with Spurgeon’s notes/thoughts on the passage. I usually end up reading the evening one the next day because I almost always forget to read it in the actual evening. Yesterday’s evening passage brought me to an interesting passage of scripture: Ezekiel 35:10. Spurgeon is trying to get us to see one basic aspect of God we sometimes under-appreciate: that He’s always there. In Ezekiel, we’re talking about God’s chosen people, and how they cannot truly be conquered because God is always with them on their side. So I (Erick) wanted to share this with you today. I’m reading Matthew 9 ESV Study Bible commentary and I came across this from the passage entitled “A Girl Restored to Life and a Woman Healed” from v. 18-26. It is the story of a well-to-do ruler who comes to Jesus after his daughter died and asks Christ to lay His hands on her so that she will live. Jesus heads on over, tells the mourners that she is merely sleeping, they all laugh at Him because they believe her to be dead, Christ goes in, takes her by the hand and she arises alive! It seems pretty self-explanatory, and I’ve read this passage more than a handful of times. I’ve seen the cartoon story of this one. There couldn’t be something new … right? What a beautiful illustration of what Christ will later do for us in our uncleanness in sin, purifying us by His blood. Keep digging in the scriptures. God is always teaching us. Always. And there is always something new to learn.